The latest distribution statistics have been released by Google and they show that only a combined 13.6% of Android devices are using Jelly Bean. 12.2% are using Android 4.1 while only 1.4% have Android 4.2 installed. Android 4.1 brings new technology to Android, like Project Butter to remove lag, and new features like Google Now, which sends to users useful information in a timely fashion. The largest number of Android users, 45.6%, are sporting a device running on Gingerbread. 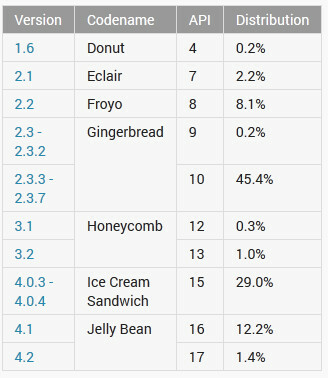 Specifically, 45.4% are using Gingerbread 2.3.3 to 2.3.7. Android 4.0, Ice Cream Sandwich, actually had a small decline and is now on 29% of Android devices from 29.1% last month. This could indicate that Android 4.0 has peaked and that Jelly Bean, which rose 3.4% in usage over last month, is on the way up. The sad part of the distribution statistics is the large number of Android users that are still using Gingerbread and the 8.1% still on Android 2.2 (Froyo). That means more than half of Android users still are using a device with Android 2.2 to Android 2.3.7 on board. Wow, 45.4% can't let GB go. Or 45.4% have no choice but to stick with GB. The adoption rate for android is too love. Android really got nothing to do with you as you don use it at all. Your comment is invalid as its only from hear say. Stick to iOS and comment there which will be your actual user experience. Actually, your comments are invalid and void. If you read the article, it clearly states information was released by Google, therefore is not hear say. He might need to stick to iOS, but you need to learn on how to read. That doesn't address anything I've said let alone the article. Or maybe it's a combination of people not updating their phones and people not upgrading to new ones yet. You'll see Gingerbread collapse in the next year. Sounds like making up excuses to me. How can people update something that doesn't have an update to begin with? Motorola did cut out a very large userbase from ICS, phones that were perfectly capable of running ICS and Jellybean. I'd believe the people not updating their phones part. A friend of mine didn't update her Razr to ICS until I told her to, 2 months later. I'm sure there are more people who do the same, and probably still haven't updated. Also, the not upgrading statement makes a good point. A fair amount of people who bought Gingerbread devices in 2011 (the year it was released) bought it with a contract, most likely 2 years long. And if their devices didn't get an ICS update, or the users just haven't updated yet, they won't get out of the GB percentage until they upgrade with another 2 year contract in 2013 (or update before then if available), in which most devices will have 4.1 installed. So over the course of 2013; you'll see 2.3 go down substantially, 4.0.x go up marginally, and 4.1-4.2 skyrocket (more so with 4.1). Not necessarily. It could also be a sign that GB is still good for second life* instead of dustbin. *second life = given to someone or sell it on second hand market. The beauty of living in Asia were there were a second hand shop. You could sell your second hand phone with a good price. This is also the reason the young generation in Asia mostly to have newly release phone compared to Europe/America market. i get you, since i am in Asia myself. But, there are very selected devices which have high demend that will fetch u a good price for your second hand device (like the GS2) I had once for fun's sake asked a dealer what he would give me for my Optimus 1 after around 5 months. He gave me a figure of 35% of the original price. IT'S A SIGN that GB device is MATURE enough from OS and hardware. IT'S A SIGN that GB device is still good for 2013. Compare this to symbian device in that time era. Do you still see Nokia X6, E7, N8, C7, C6-01 on daily basis? or perhaps iphone 2G and 3G? I continue using my N8, but it was updated to belle. You will be surprised if you upgrade your phone New generation phone is so sweat. I sell my Nokia N8 for US$ 120 to second hand shop in Indonesia last december and upgrade to Nexus 4. It's just the company's are to stupid to update the devices like they say they would and this is what it leads to is not everybody knowing if the new OS is worth getting or not. thats 45% just needs to learn how to root. What happened to ICS unifying the ecosystem so updates are more consistent and timely? This article says otherwise. And the sky is blue. That's not what I meant. I am only referring to people who have ICS but do not have Jellybean yet or are just getting ICS. At least when Android devices do get updated, we get the full update. I still don't have Siri on my iPod Touch 4th gen, and if I still had my iPhone 4 I wouldn't have Siri on that either. iOS devices might get more timely updates, but at least Android devices don't get features torn off of the update when they do get them. However, if you bring rooting/jailbreaking into the picture, I could have Siri on my old iDevices and I could have the latest version of Android on my old Android devices. You see? There are trade offs; iOS; timely updates, but features are stripped off the further back the generation. Android; delayed updates, but when they are updated they get the full update. Also, extra features in the manufacturer skin partially make up for the delayed updates, and lessens the need for updates. Have fond memory of GB. My first Android device.